A previously released prototype of New York City Transit's new rail cars. Photo: MTA. New York state’s Metropolitan Transportation Authority (MTA) has approved the purchase of 535 carriages for New York City. Rolling stock manufacturer Kawasaki Rail Car will build the R211 subway cars in Yonkers, New York and Lincoln, Nebraska, for use on the B Division of the city’s subway as well as the Staten Island Railway. The order is worth $1.4 billion (∼€1.1 billion) and includes spare parts, special tools, diagnostic test equipment, technical documentation, and training. It will be funded by the Federal Transit Administration, an agency within the United States’ Department of Transportation. The contract also includes options for up to 1,077 additional cars, taking the total up to 1,612 cars at a cost of $3.7 billion (∼€2.9 billion). This is pending future MTA board approval. 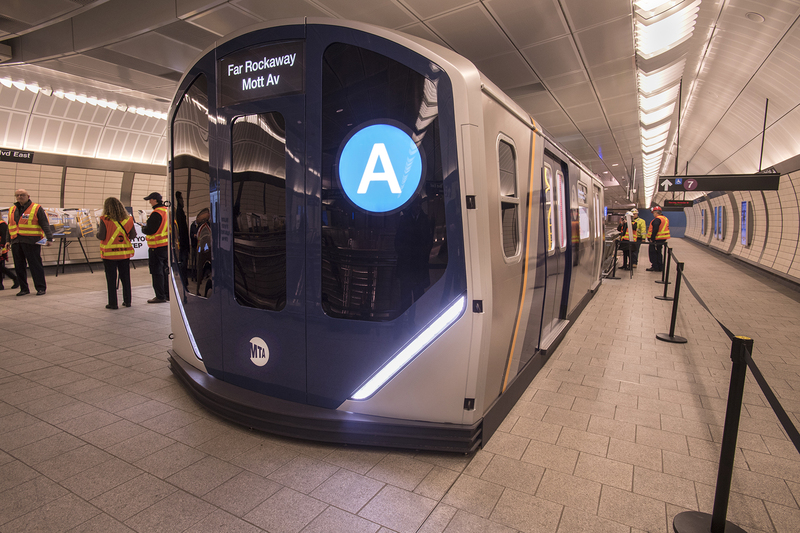 For the initial contract, Kawasaki will design and deliver 440 closed-end cars for the subway’s B Division – which includes all the lettered services – 75 closed-end cars for the Staten Island Railway and 20 open gangway cars as part of a pilot program to MTA’s New York City Transit (NYCT). These open gangway cars allows riders to move freely between cars to reduce crowding and distribute passenger loads more evenly throughout the train. Photos of the new carriages’ design which were released by MTA in 2017. The R211 cars feature 58-inch wide door openings – eight inches wider than standard doors on existing cars – to reduce delays and speed up train movement by speeding up boarding and reducing the amount of time trains sit in stations. Cars delivered to the B Division will be compatible with Communications-Based Train Control, enabling New York City Transit to deliver more frequent and reliable service by operating trains more closely together. All of the cars also include digital displays that will provide real-time, location-specific information about service and stations, new grab rails including double-poles, and brighter and clearer lighting, signage, and safety graphics. NYTC president Andy Byford, who recently joined the transport agency, described the contract as a “bold, aggressive initiative” as part of a multi-faceted approach to improve the subway’s service. Kawasaki has previously fulfilled a number of contracts for the New York City Subway, including both the R160 and R188 cars. Kawasaki Rail Car’s train production factory in Yonkers, New York. Photo: Kawasaki.